On a semi-logarithmic scale, an exponential decrease gives a straight line. T1/2 of a drug is generally independent on the dose and here the straight lines are parallel. 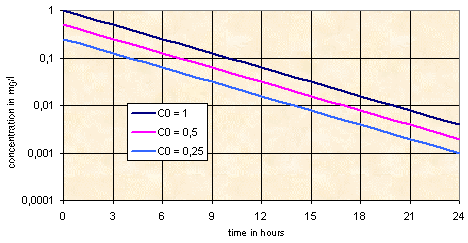 The time necessary to obtain a concentration decrease from 100 to 50 units is the same than to obtain a decrease from 10 to 5.